When a rogue cult turns deadly, the FBI call on former conman Agent Saul Marshall. 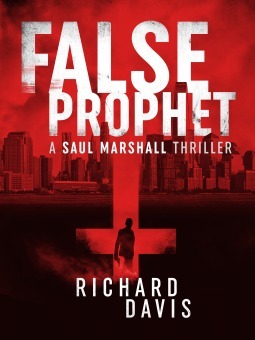 FALSE PROPHET introduces a gripping new series from thriller writer Richard Davis. I enjoy settling down with a good thriller every now and then and I knew I’d found one when on the first page a character reads his own obituary in the newspaper. There’s no way I can put down a book after that. The author has created an intriguing character to build a series on – Saul has a fascinating backstory, both good and bad aspects, with varying shades of gray. The fact that he’s a former conman made me want to read this book, but it didn’t really factor into this novel. Since it’s mentioned in the description, I’d hoped it would come into play somewhere, but maybe that’s for a future plot. With all the twists and turns taking place, Saul is really put through an obstacle course and the plot moves along at a vigorous pace for the most part. Something I noticed is the setting of this book is in various American cities and the characters are American, but several times throughout the book English terms are used (petrol vs. gas, post vs. mail). I understood the meanings, but stumbled every time I came across something. False Prophet is an exciting debut for this author and promises a compelling series to come. If you’re a suspense/thriller fan, I recommend adding this to your list.